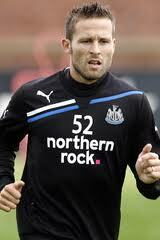 Yohan Cabaye ankle injury | NUFC Blog. Archive for tag: Yohan Cabaye ankle injury. Newcastle United midfielder Yohan Cabaye fears he may have ligament damage to his ankle. Yohan Cabaye is worried that he picked up a bad ankle injury whilst on international duty for France on Friday. France were playing Albania and by all accounts Cabaye had put in a tidy first half performance but he was substituted just 3 minutes into the second half. “I preferred to be substituted and not take any risk.